This was a wallpaper I made along with a banner for a friend's gallery. The background is pictures of blossoms I took myself from the backyard. 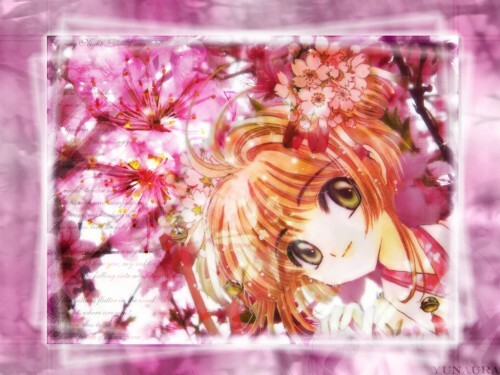 lolz, I think the wall is too pink, but with Sakura from CCS in it, it's a hard color to avoid. =^.^= My second wall ever, so I'm still fixing any bugs with the blending work and such. wooowww kiseki!! this wall is sooo lovely!! I like so much the pink colors and flowers!! Sakura is sooo cute here! This Sakura waliie is so beautiful ! The color is not too soft and not too rough, the color is balance and elegant. This the best Sakura Wallie, i ever seen.